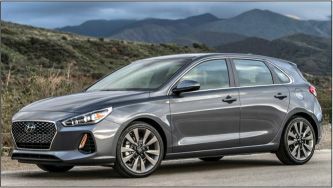 “Hyundai has come a long way from being just a ‘value brand.’” The Korean automaker’s new Elantra GT Sport hatchback won’t dethrone Volkswagen’s Golf GTI as the driver’s choice among compact five-doors. But it’s packed with features and might be the ultimate expression of “a downrig ht excellent little car.” It arguably edges out the Ford Fiesta ST to deliver the most performance per dollar that a new-car buyer can get. The base-model hatch isn’t nearly as impressive. All models benefit from new “fashion-forward” exterior styling, marred only by an ill-conceived back end. And all provide class-leading cargo capacity. But the base model’s interior is loaded with hard plastics, and the entry-level engine “squeals in agony when put through the paces.” The $23,250 GT Sport benefits greatly from an upgraded suspension and its 201-hp engine, and that turbocharged inline four can be paired with a “smooth and crisp” six-speed manual transmission.